The best location to start your holiday? Our hotel's location in Schiedam next to the A4 and A20 highway, cities like Rotterdam and The Hague are easily accessible by car. Enjoy the possibilities with free parking, spacious rooms and free WIFI. Explore the many cultural attractions in the surroundings of the hotel, including the Stedelijk Museum Schiedam, Boijmans Van Beuningen Museum or Chabot Museum. Or go shopping at the Nieuwemarkt and Pannekoekstraat, aka the SoHo of Rotterdam. You can also enjoy a day in the historic city Schiedam, just a 15 minute drive away. Schiedam is famous for gin and the largest windmills in the world. Near the hotel, the beautiful wild gardens of the Prinses Beatrixpark are ideal for romantic walks. Novotel Rotterdam-Schiedam is located next to the A4 and A20 highway intersection. Several bus and train stations are within walking distance to the hotel. From here, you can easily reach Schiedam or Rotterdam's city centre. The spacious rooms at the Novotel are furnished in a contemporary style with a flexible layout. They are enjoyable to stay in and will meet all your requirements. We treat your children as our VIP guests. Accommodation and breakfast are free of charge for one child up to 16 years when sharing a room with their parents or grandparents. 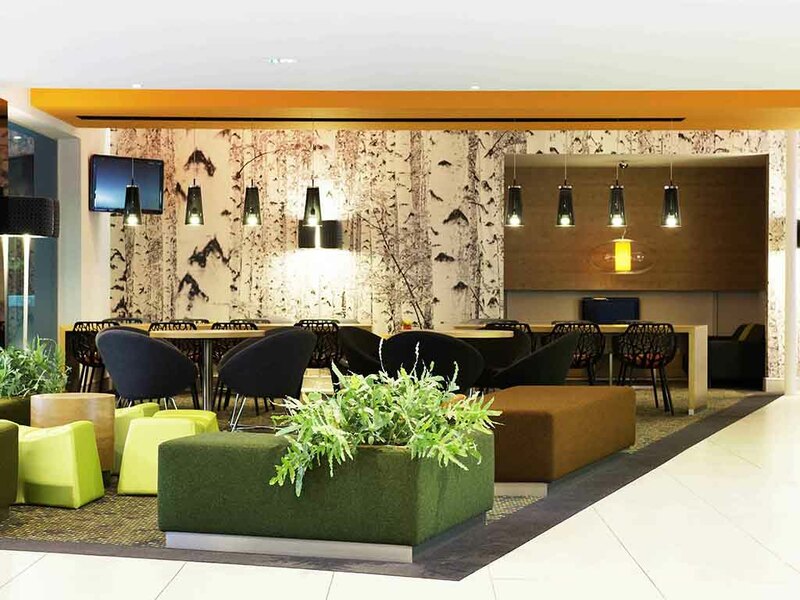 Novotel Rotterdam Schiedam has a welcoming and stylish bar where you can enjoy a drink and a snack. In addition to a range of beers, wines and soft drinks, we're also happy to mix you one of our special cocktails. Superb experience, friendly staff, very good ambiance and environment. Friendly, helpful, clean, all that i need when away on business. I have stayed at your hotel on a large number of occasions over the last 2 years and found nothing to disappoint me. All that i need and your staff are always happy to help. Hotel is dated but refurbishment was done well and bathrooms very nice. Customer service very good. Dinner wasn't available past 2200, plus there was nothing available through the bar (despite having numerous people). Room amenities limited (no conditioner or lotion). Toilet is way too close to the wall. Very good service, and nice staff. Breakfast requires improvements. It was a nice exxperience by all means. Personell: friently, efficient, polite, ready to respind to our needs, smiling. Ambience: nice, well decorated, clean. Location: very convenient, next to the motorway exit, very good parking space. Breakfast: excellent in bot quality and quantity. Wifi: fast. A bit remote but nice. The elevator was ugly and dysfunctional. Otherwise nothing to complain. A nice stay albeit not problem free! NO hot water on Saturday night (for about four hours+), room phone didn't work, newly &quot;renovated&quot; and quite nice and comfortable, but sink drain requires attention as it drains way too slow! A VERY long walk from the parking lot to the our room. I don't understand why a &quot;keyed&quot; guest door wasn't installed during the &quot;renovation,&quot; oh I meant &quot;redecoration&quot; of the facility. P.S. Hot water restored by service technician after a few hours. So, it really wasn't a BIG problem! Friendly happy to help and all i need was available. The Novotel Schiedam team are i believe a benchmark for the others, friendly efficient and happy to help. Reception and rooms are good. Restaurant is not very good. Restaurant choices for dinner are quite limited and quality of dishes is medium, but not great. Breakfast, however, is good. I really enjoyed my stay in the hotel - nice and clean rooms, stuff very helpful and polite. Our coffee breaks during the conference were amazing. high quality snacks and presentations. Good variety on a breakfast menu. However I was not impressed with carpaccio - specifically type of cheese on it. And another minus point for strange toilet smell at the entry of the hotel. Very minor points though - my stay was still enjoyable and I would recommend this hotel for others. Excellent service from room maids. Very friendly!!! Arrogant service from 2 restaurant guys not only once but on several occasions. The waiters and waitresses were super!!!!! Reception personnel were great. Amazing and on point service. Will sure be back. The second night was expensive,booked through the hotel. We had expected breakfast to be included. Nice staff. Relaxed atmosphere. Room comfortable.